The image below is a random wire antenna that I have erected in my backyard as an alternate or backup antenna to my MFJ-1796 multiband vertical. I have been beating my head trying to model this in EZNEC and I am not having any luck. Could some kind soul who knows how to use this program get me started? As the first section of wire before it climbs at an angle is at a right angle to the rest of the wire. I drew everything in a straight line to show all the lengths. BTW, if my math is correct, there is about 23' of wire to the top of the first pole which leaves 30' for the other other side. 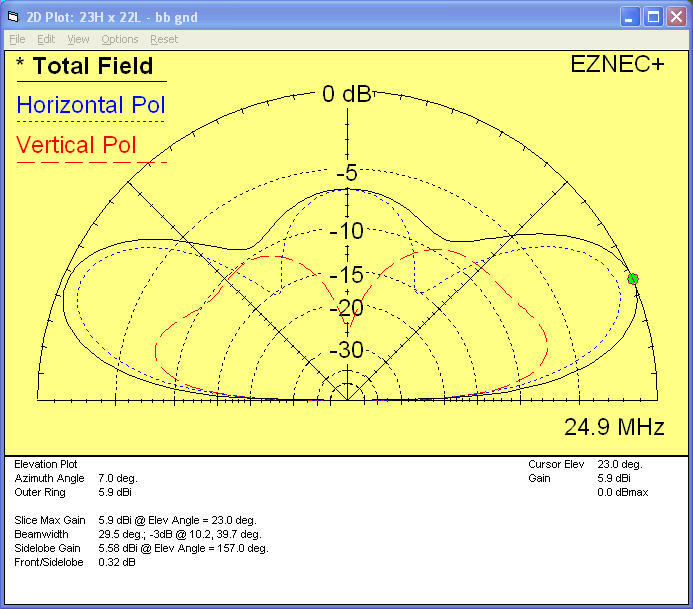 I would like to be able to see the nodes and radiation angles for 80m - 10m assuming I can get it to tune. I'm still working on the ground and radial system so I haven't been able to use it yet. the first wire goes from 0, 0, 0, to 0, 0, 5. Now the problem is figuring the last piece of wire. We know the starting point is the second end of wire #3. Let's start by assuming we run it all the way to the end support, which would be ( 26 + 45, 0, 12 ). length of the last wire. In your wire list right click on the far end of that wire and choose, "Change Length to". Enter the desired length and it will move the end back in line with the wire to the right spot. Put the feedpoint in wire #1, at 0% from the first end. Relative to 450 ohms, the SWR is > 10 : 1 up to about 13 MHz, and mostly under 5 : 1 above 17 MHz. 10.7 MHz (32 ohms), 17.8 MHz (100 ohms), and 25 MHz (100 ohms). would be 8 / (8 + 16 ) = 33%. Pretty omnidirectional on 80m and 40m, but has some dimples in the direction of the wire on 20, 17 and 12m. I will model it, but first some observations; no modeling required. 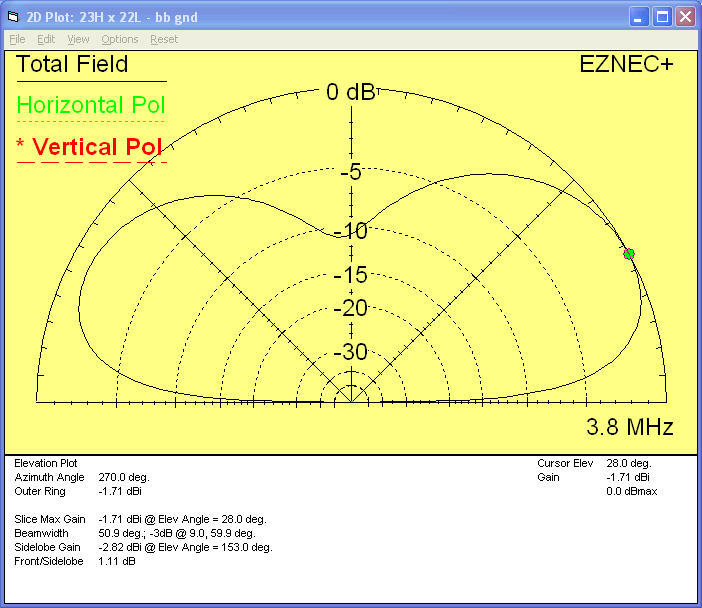 It seems you are looking for an end-fed antenna, which works on multiple bands without having a wide-range remote tuner, and which might work without an extensive radial field. The only configuration that offers some hope is a wire which is a half wavelength at the lowest frequency, and can be operated on harmonic multiples at 2f, 3f, 4f, and so on. If you really expect it to work on 80m and other bands, then it will have to resonate somewhere in the 80m band, while the second harmonic resonance falls into the 40m band, and the fourth into 20m band and so on. These resonances are nearly integer multiples (but not quite). Starting at 3.56MHz, the required wire length is 468/3.56 = 131ft, which would also resonate near 7.12MHz and 14.24MHz. No. Cond. Diel. Const. Height R Coord. direction of wire 2 is to have those change the Y coordinate rather than the X coordinate. Although not shown on the diagram I will be using a LDG remote auto-tuner which according to the specs can tune loads from 4 - 800 ohms. I may have to choose a different unun, but I'll look at it with my AA-54 after my radials are in place. My goal is to be able to use 80m since my vertical doesn't support that band at all. I don't have a lot of space on my lot and the 25' mast is about the same height as the single tree on my property that it is strapped to. I am going to try to use your instructions in your first post to see if I can start getting a handle on EZNEC. Since I live in Florida, and not on the beach, I'm assuming I am going to have significant ground loses unless I bury a lot of wire. My lot is just a big sand box. Fingers crossed on the EZNEC. I really want to learn to use it. I assumed you were trying to make it work without a tuner. With a tuner, your proposed overall length of 71 ft put the feed impedance within range of your tuner on 80-75m, 60m, but not at 40 or 20m, with or without the balun. If you lengthen the wire such that the last piece goes all the way to the top of the Fiberglas pole, making the total wire length ~89ft, then the tuner could match it without a balun. If you wouldn't mind, would you send your file to my email at JoAnn.Peeler@gmail.com? I really need to work through some sort of a tutorial because I don't know how to connect the ground to the source in the diagram to I created. You have to think of it as adding a source along a wire somewhere. a source in it somewhere. If you terminate one end of a wire at ground (that is, at height = 0 ) then it is connected to ground. top of the antenna, basically ignoring the source. Then you add the source at the bottom of the wire. of the wire length from one end, it will actually put it in the center of the first segment of the wire. wire is in the center of a segment. Thanks for the tip. I think this was what I have been missing. After playing with EZNEC this morning, I think I am going to reconfigure the antenna to remove the 15' long, 5' high run and to shorten the overall wire length to about 44'. This will get me a marginally acceptable pattern on 40m although I still have a lot of signal directed straight up. However, things look much better on 20m and 17m. The other bands are pretty node-y, but definitely usable. You started with a total length of 71 ft and now you are shortening it to 44 ft? What happened to your goal of working 80 meters? Are you using an unun, or not? If so, that can be included into the EZNEC model. Calculate the impedance of the antenna on the bands of interest and try to keep it within a range that the tuner can match. If you are using a Mininec ground, you can estimate the loss produced by a radial system and insert that loss as a resistor on the ground side of the feedpoint, instead of modeling a radial system. Loss resistors of 5 to 15 ohms are typical. Remember you are in a heavy duty lightning area. Even if the antenna never gets hit directly you will probably want something to protect the tuner from induced lightning currents from nearby strikes. 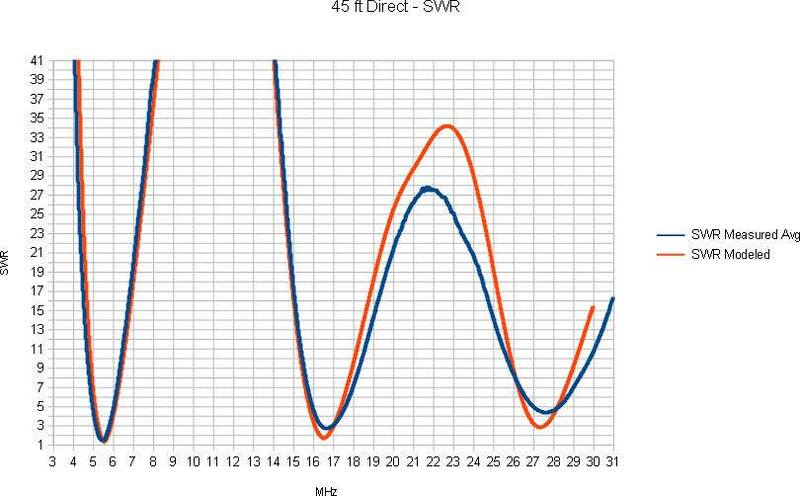 If you are interested in something around 45 ft for 80 M - 6 M in the Inverted-L configuration, I have the gain patterns and SWR plotted out in my blog. Note that it requires a decent radial system for efficiency sake on the lowest bands - especially since it is short on 80 M compared to a 1/4 wave. On the lowest band, a loading coil is used, while on the higher bands a 9:1 (or 4:1 with very little difference) is used to knock down the SWR to manageable levels. The nice thing about a unit that is non-resonant on most bands is that it can be made to work reasonably efficient on all bands (even with the tuner in the shack, when using decent coax). In addition, the radiation patterns are all nice low angle radiation for all bands. FWIW, I use these 23 ft tall x 22 ft wide units here, as well as a 45 ft tall x 45 ft wide for 160 M - 10 M. Anyway, here are the links if interested, as well as some gain plots and the raw SWR plot. Since this is devolving into a quarter wave driven against a ground-plane, then it is best to have the part of the antenna near the feedpoint vertical for as long as possible, and then turn the corner to horizontal. That is where the inverted-L come from. I was sad about that, but looking at the impedance at 80m its way too low to use the unun and the antenna already has poor radiation pattern on most of the bands. I was trying to think of how to optionally support extending the 44' wire so that I could take advantage of a better radiation pattern, but still be able to work 80m as-needed. I think I would need to use a alligator clip jumper to connect around the end insulator and extend out to 71' (or longer) and also switch out the unun. Before I do that I thought it would be a good first step just to get the 44' wire working first. With regard to lightning protection, I hear ya. I have an 8' ground rod that will be tied into the radial system and I will be attaching a polyphaser surge protector there and an alpha delta surge protector on another ground rod before the coax enters my shack. All my ground rods are tied together with 6AWG ground wire and also connected into my home's ground system. BTW, I'm using two different surge protectors because the alpha delta will pass DC that's required by the bias tee used to power the tuner. The other surge protector will be on the other side of the tuner and will protect it from static surges; however, I'm not under any impression that it will protect it from a lightning strike. Knock on wood, but I have never had any damage from RF or AC surges so I must be living right. If you use LDG, you do NOT need 9:1 unun. What you do need is a common mode choke BEFORE tuner. Do not forget to add choke for control cables too! You will have to add grounding and some radials for all this to work. You you do not add radials - rods are not enough, tuner will likely fail simply won't be able to work at all due to common mode current on coax and (more importantly) control wires.